We live in a fast-evolving digital world, with technology advancing in ways we never dreamed possible. The entire world is now a tap, swipe or click away from us and our devices. This digital age is our new frontier, and at Norton we believe that everyone has the right to explore it without fear. Everything we do at Norton focuses on protecting that freedom and our explorers. In the 1970s, a new and exciting technology emerged: the personal computer. Although supercomputers had been in the workplace for several years, the PC truly made technology personal, bringing computing into our homes. Unfortunately, as with many inventions, bad guys soon learned how to exploit this new technology. It didn’t take long for the first computer viruses to appear. Luckily, these first viruses were relatively easy to contain, since many were transmitted via infected floppy disks. But once the Information Superhighway connected every Internet-enabled computer in the world, viruses became legion and put every computer user at risk. In the United States, Symantec was one of the earliest tech companies to fight against these computer viruses. The company was founded in 1982 by Gary Hendrix, a pioneer in natural-language database technology, and expanded into utility programs and database systems with features designed to be easy for people without advanced computer training to use. Q&A was Symantec’s first big success, with impressive sales and an extensive list of retail sales contacts. However, the growing company realised it couldn’t sustain growth with one major product. Symantec soon launched a strategy of buying existing products and companies to deliver the best solutions to its customers quickly. By the end of 1988, Symantec had expanded its portfolio to 20 products, many of which were utilities. But with competition increasing, Symantec decided to focus on an as-yet undeveloped market that could also protect its customer base: antivirus software. 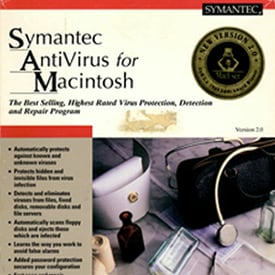 Symantec began to develop a DOS-based antivirus program in 1989, but actually released its first antivirus product for Apple computers, Symantec Antivirus for Macintosh (SAM), that same year. The product sold well from the start, generating sales of $100,000 in its first month. More important was that, in addition to being Symantec’s first antivirus product, SAM also set a standard that Norton adheres to today by applying technology that enabled the program to intercept and eliminate new viruses, even ones that did not yet exist. Motivated by the success of SAM and requests by clients citing the need for more antivirus products, Symantec soon purchased Certus Corporation (the maker of Novi antivirus). With Symantec’s background in utilities software, it was not surprising that the next company Symantec acquired, in 1990, was Peter Norton Computing — best known for its Norton Utilities software. Just one year later, Norton AntiVirus for PCs launched, Symantec’s very first antivirus software focused on the consumer market. In that same decade, with use of the World Wide Web growing exponentially, Symantec made another innovative first with LiveUpdate, a Web-based program that let customers download virus definitions and firewall rules from Symantec’s website to keep related products up to date. With LiveUpdate, Symantec became the first company to enable customers to dynamically add code to a base product without having to reinstall the software itself. The story of Symantec and antivirus didn’t end with the rise of the Norton brand. Even as Norton began to leverage its enterprise technology for consumer products, Symantec continued to build solutions for businesses that wanted to secure all aspects of their enterprise. Then, on March 26, 1999, Symantec — and the rest of the world — met Melissa. The Melissa email virus, the fastest-spreading infectious program at that time, drew international attention as each infected computer emailed the virus to the accounts of 50 contacts. When thousands of people turned to Symantec for answers, it became clear that the company had established a reputation for being an industry leader in security. And both LiveUpdate and Norton AntiVirus delivered solutions to combat the virus. In the aftermath of Melissa, Symantec realised the critical importance of its antivirus business and continued to add to its antivirus intellectual property. These technologies and the vast assemblage of global intelligence gathering networks are what form the core of the Norton consumer security products today and continue to protect our digital explorers from online threats. Because of the pioneering antivirus solutions first released 25 years ago, Symantec and the Norton brand in particular are now synonymous with computer security. As technology grows more sophisticated and complex, and people more and more eager to explore their digital domains, Norton remains at the forefront of computer security, even broadening its scope to protect customers from all digital dangers, whether they’re at home, at work or on the go. Today, Norton products protect 43 million customers in 28 countries from threats to PCs, Macs, smartphones and tablets with products like Norton Security and Norton Mobile Security. We continue to be pioneers by planting security flags in the digital landscape, establishing new standards for all security companies. At Norton, we’re so confident in our ability to protect customers that we give them our Virus Protection Promise. No other security company promises to keep its customers’ devices virus-free, or issue a refund. We look forward to pioneering the future of security, changing in response to our customers’ needs but also innovating and evolving new ways of protecting current and future generations of our digital explorers.